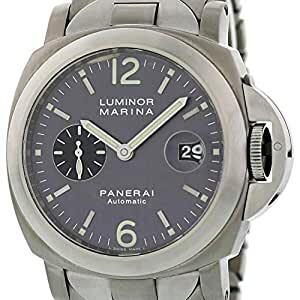 PANERAI LUMINOR MARINA PAM 91 TITANIUM AUTOMATIC LIMITED RUN. 44MM TITANIUM CASE AND STATIONARY BEZEL. BLACK DIAL WITH LUMINOUS HANDS AND INDEX MARKERS. MINUTE MARKERS AROUND THE OUTER DIAL. MAGNIFIED DATE DISPLAY AT 3 O’CLOCK. SMALL SECONDS SUB-DIAL WITH LUMINOUS HANDS AND INDEXES. TITANIUM BRACELET WITH BUTTERFLY PUSHBUTTON CLASP. WILL FIT UP TO A 7.25-INCH WRIST. CALIBER OP III SELF-WINDING MECHANICAL MOVEMENT WITH A 42-HOUR POWER RESERVE. THIS WATCH IS BACKED BY OUR ONE YEAR WARRANTY.. BUY WITH CONFIDENCE KNOWING EACH TIMEPIECE GOES THROUGH THE SAME RIGOROUS 31-POINT INSPECTION. REST ASSURED ONLY AUTHENTIC PARTS STRAIGHT FROM THE MANUFACTURER ARE USED. THE CERTIFIED PRE-OWNED PROGRAM ON AMAZON ENSURES PEACE OF MIND AND TRANSPARENCY VIA STANDARDIZED REPORTS AND A 1 YEAR WARRANTY PROVIDED BY WATCHFACTS.